Dad… oral history and family tree of Carty / Coyle families. Print records verifying Drake and allied families. 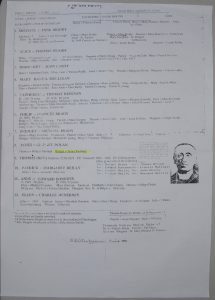 Philip Hourican Family Group sheet with descendants – Line going back to Phillip Smyth of Grousehall, Loughduff, Co. Cavan. [S91] Philip Hourican, “Philip Hourican’s Family Sheet” (UK). Philip Hourican, second cousin to Maggie Price Sawkins, produced a family group sheet and gave Maggie a copy. Maggie sent a copy along to Beth Hammonds.. . The descendants of HUGH DUIGNAN of Fenagh, Leitrim.